Fixing your pet is the right thing to do, for your pet's health and safety, as well as for the good of the community! even letting your dog or cat have just one litter has major consequences. The illustration below shows how quickly things can get out of hand! 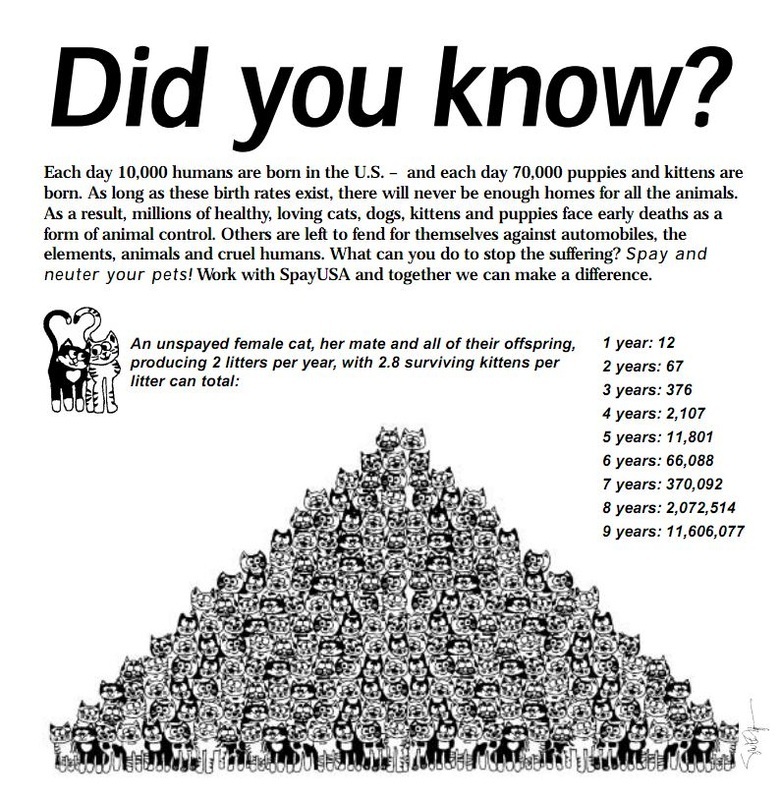 Please spay or neuter your pet as soon as you can -- ideally before they are 6 months old! KV-POP provides financial assistance to those who could not otherwise spay/neuter their pet. We are partnering with the Kirksville Small Animal Hospital to offer KV-POP spay/neuter vouchers and coupons for individuals with low income, multiple pets, or other hardships. If you would like to apply for spay/neuter assistance, you may complete our application online, download and complete the application form below, or contact us by mail, email (info@kv-pop.org), facebook message, and we will send you an application via US mail. Contact us for an application OR download this pdf. Read more about our special March Spay/Neuter Campaign here. Please note: A full committee considers every application. We send award letters via US mail. Expect to wait 4-8 weeks, but wait time may be even longer during our spring spay/neuter campaign and during fund raising drives. We are volunteers trying to do the right thing on behalf of area pets. Thanks for your kind patience!